FLINT HILLS NATURE TRAIL, Kan. – Where locomotives once chugged across the eastern-Kansas prairie, hikers, joggers and bicyclists can trek the same route today along the currently completed 95 miles of the Flint Hills Nature Trail. On Saturday, Oct. 7, 2017, the first Rush the Rails event will fill the trail with riders and bikers, with a planned relay race, bike rides and festivities along the completed portions of trail. 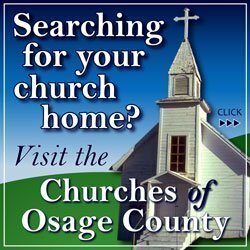 Starting at Osawatomie in the east to Council Grove in the west, four and eight-person relay teams will set out at 7:30 a.m. from John Brown Park, in Osawatomie, and run the entire 96-mile route (a short detour adds an extra mile to the 95-mile trail). Bikers can choose from three distances: the full 96 miles starting at Osawatomie (7 a.m.), 54 miles from Pomona State Park (8:30 a.m.), or 25 from Admire (10:30 a.m.), with all running and cycling events ending in Council Grove. “There’s so much beauty to see along the trail – from the eastern woodlands and the Marais des Cygnes River and its rocky bluffs on the east to the stunning Flint Hills on the west,” said LeLan Dains, Rush the Rails organizer, about the prairie pathway. Dains also serves as operations manager for Dirty Kanza Promotions, which is helping manage Rush the Rails and is renowned for its annual Dirty Kanza 200 endurance ride through the Flint Hills. Rush the Rails passes by 10 towns, among the largest Osawatomie, Ottawa, Pomona, Osage City, Admire and Council Grove. 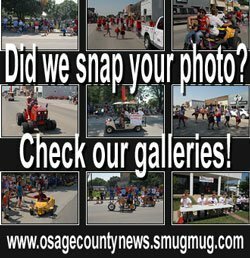 Osawatomie kicks off Rush the Rails Friday night, Oct. 6, with a bonfire, free hot-dog roast and live music by the Route 66 band at John Brown Park. 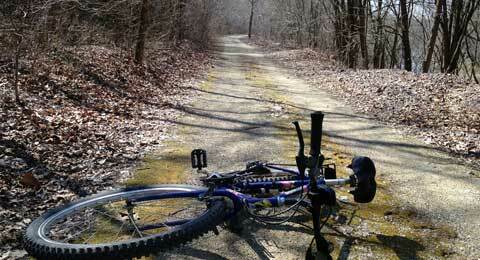 On Saturday, a musket firing starts the bike ride beginning at 7 a.m. at the park. To the west, Ottawa gears up with a street dance, food trucks and beer garden Friday night and vendors and kids’ bike activities on Saturday morning, when the participants will pass through. Farther west, Pomona State Park hosts food and craft vendors and offers free park entrance for the day. Two miles south off the trail at U.S. Highway 75, the Lyndon community is celebrating its annual fall festival with a day of fun, including kids games, bounce house, touch-a-truck, and crafts, vendors, and food. 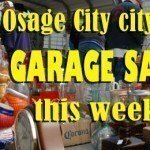 Osage City is also planning a festival to celebrate the race, including food, crafts, inflatables for kids, and an ice-cream social at Santa Fe Park. Admire, where the 25-mile short-distance bike ride begins, plans to open its North Lyon County Historical Museum for the day and serve refreshments. Finally, Council Grove wraps it up with its Rush the Rails finish line celebration at the town’s landscaped Neosho Riverwalk, a paved walkway that connects with the Flint Hills Nature Trail along the Neosho River banks. Daylong river walk entertainment includes food vendors, kids’ games and bike rodeo, bike show, live music, beer garden and fireworks along the river. Organizers point out that the events in trailside towns aren’t just for the racers and bikers. “We want everyone to come to the finish line or along the trail and cheer these people on,” said Council Grove organizer Ricci Ziegler. “Even if you can’t make it to Rush the Rails that day, we encourage you to check out the family-friendly trail any time and discover the scenic sections and quaint towns all along the way,” said Linda Craghead, assistant secretary of Kansas Department of Wildlife, Parks and Tourism. Flint Hills Nature Trail has been a years-long undertaking by the volunteer organization Kanza Rail-Trails Conservancy, but the trail remains uncompleted. For the past few years, the Kansas Department of Wildlife, Parks and Tourism and the Kansas Department of Transportation have administered state and federal funds that have been used for development projects along the trail. Once completed, the Flint Hills Nature Trail will stretch from Osawatomie to Herington, for a total length of 117 miles. For more information about Rush the Rails, see www.rushtherails.com. Information thanks to Kansas Department of Wildlife, Parks and Tourism. Photo by Osage County News.